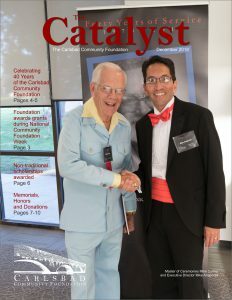 The latest issue of The Catalyst is full of news from the Carlsbad Community Foundation! In this issue, you’ll also see photos from the Foundation’s celebration of 40 years of service to the community, grant presentations for National Community Foundation Week, scholarship awards to continuing and returning students and much, much more! You can sign up to receive future issues of our newsletter in your e-mail Inbox by filling out the form below. Click here to read the December 2018 Issue of The Catalyst on your computer, tablet or smartphone in PDF format! Signup for our online subscription – FREE!